Improve the display of an app's non-Retina elements. Is there a better alternative to Retinizer? Is Retinizer really the best app in Desktop category? Will Retinizer work good on macOS 10.13.4? Retinizer allows apps that aren't Retina-ready and are displayed pixelated at 1x to display their UI widgets at 2x. That way, only their custom images will look bad and not the whole app. 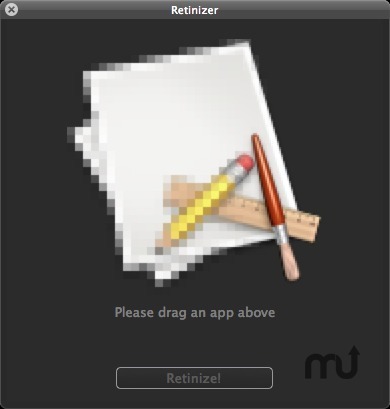 To use it, just drag an app (and make sure it's closed) into the window and click the Retinize! button. Retinizer needs a rating. Be the first to rate this app and get the discussion started! So far, it seems only apps that use Carbon, directly (like Snes9x) or indirectly (wxWidgets, Qt apps) draw their widgets at 1x on a Retina display, while Cocoa apps seem to always draw widgets at 2x. But some apps, such as Eclipse, draw at 1x and use Cocoa (albeit with some weird Java bindings or something like that, not sure). This app also helps in that case. Please note that this app won't make apps get retina images. That means, custom icons, such as those in the Preferences window, will still look ugly. It has only been tested with OS X 10.8 but should work fine with 10.7.4. You must have Gatekeeper disabled or open the app with Ctrl-Click->Open, as I don't (yet) have a Gatekeeper Certificate.